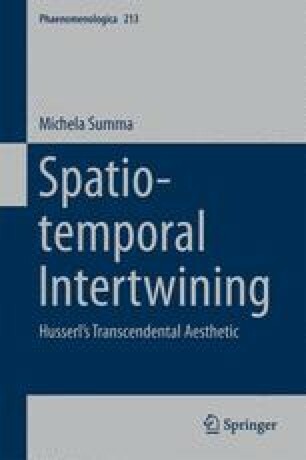 In this chapter the specificity of the phenomenological approach to spatiality and temporality is discussed. In both respects, Husserl’s analyses aim to fulfill two basic tasks, namely: (1) to describe the a priori structure of spatial and temporal experience; and (2) to analyze the constitution of both lived and objective space and time. The analysis of Husserl’s texts shows how both parallelism and stratification characterize the phenomenological approach to the pivotal questions concerning the intuitiveness and the constitution of time and space. Through the discussion of the analogies between the phenomenology of spatiality and temporality, both the potentialities and the limits of such a parallel account are discussed. This critical discussion allows us to already introduce the necessary co-reference or interweaving of both dimensions.